We all experience times in our lives when we are persecuted by our family members, friends, colleagues, bosses and others. 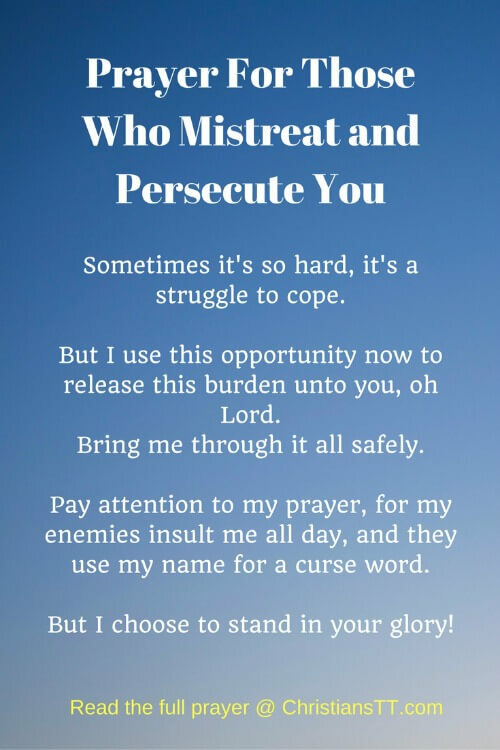 Even though this persecution may persist for a long time, instead of retaliating as they expect and want you to, take it to the Lord in prayer. Let the Lord fight your battles for you. This prayer can be used daily as you surrender all to our Lord and Savior, Jesus Christ. Dear God, the Alpha and the Omega, I thank you for being by my side when, for no reason, they persecute me. Lord, it hurts so much when I am abused, accused and condemned. They bring all manner of falsehoods against me. But in the midst of it all, I know that you will preserve me. I will arise stronger and better, because you are on my side. No weapon formed against me shall prosper. You, Lord, are all powerful and almighty. And despite the situation I’m in, I place my trust in you. All things work for good for those that love the Lord, are your assuring words. Continually speak your assurances into my heart and fill me with your peace that passes all understanding. For Lord, I cry out to you today! Nothing is too difficult for you. Leviticus 19:18 Do not seek revenge or bear a grudge against a fellow Israelite, but love your neighbor as yourself. I am the LORD. Sometimes it’s so hard, it’s a struggle to cope. But I use this opportunity now to release this burden unto you, oh Lord. Take me and carry me in your arms. Bring me through it all safely. Pay attention to my prayer, for my enemies insult me all day, and they use my name for a curse word. But I choose to stand in your glory. I will not be moved! Proverbs 24:29 Do not say, “I’ll do to them as they have done to me; I’ll pay them back for what they did. Your word says that for all who are persecuted, the Lord brings justice. But Heavenly Father, please forgive them, because they truly do not understand what they are doing, and they don’t know what it is to be a child of the Living God. Don’t let your wrath fall upon them. Despite what they attempt to do to me, Lord, bring them back one day in repentance for their evil. As you did with Joseph, lift me up on high. In the meanwhile, shield my thoughts with your peace, comfort my soul with your love. Dry my tears. I praise and thank you for everything, in Jesus name, AMEN!